sections between the ties (about 0.12mm amplitude, 1000 Hz). The raid pad prevents rail-sleeper abrasion and the crushing of the sleeper under the rail foot. Rubber rail pads are normally designed to a specified load-deflection characteristic. The initial stiffness of the rail pad is designed to be low so that that their deformations under the springs toe loads is quite substantial. This ensures that the rail pad remains in intimate contact with the rail despite any vertical movements of the latter. When the wheel is over the pad, the latter's stiffness must be high to prevent large movements which can result in the metal spring becoming loose. Such a load-deflection characteristic can be obtained by introducing grooves in the rubber rail pads. 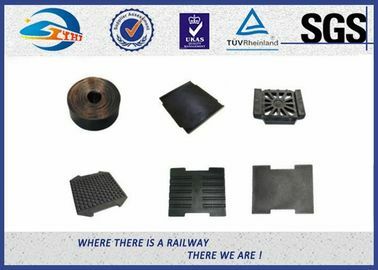 Rubber pad or grooved rubber rail pad are made up of rubber or plastic to dampen the shocks of vibrations of a passing train. are used to reduce extensive vibrations. are available at a reasonable price. The ray pad is an end product made from synthetic elastomer and is used in heavy crane roads and between rail and supporting structure. 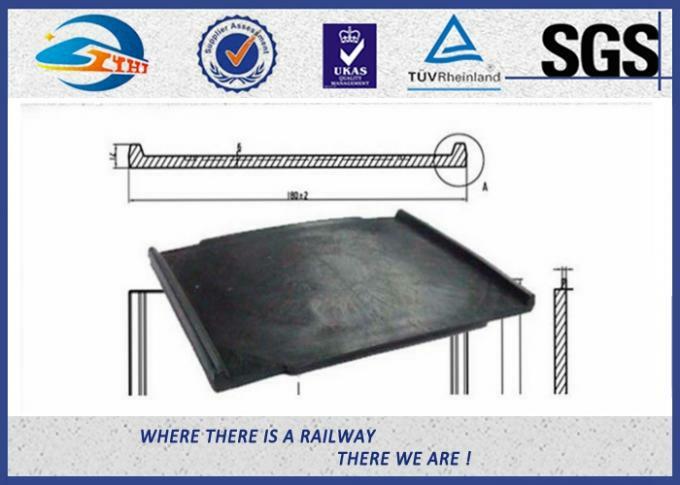 It is manufactured in various widths determined according to rail base dimensions and standard length of 12 m. The rail pad may be manufactured in different lengths and sizes due to special demands. The combination of studded design and specially formulated rubber compound, gives VIP-Polymers patented rail pads a unique high resilience and abrasion resistance. Their superiority to those manufactured from other materials has been proven by their ability to reduce dynamic forces by up to 65%, which is a crucial consideration for railway systems worldwide as they adopt higher speeds and greater axle load.The resilient crane rail pad is designed to allow the rail to move and rotate by small amounts. When rails are on a pad (called soft mounting), this helps to ensure a more even stress distribution between the crane wheel and rail and also between the rail and the surface on which it is fixed. There are two rail pad types, one for a continuously supported rail and one for discontinuous mounting. SUYU specializes in producing rail fastening. A rail pad lies between the rails and base plates to keep the rail stable. It can be made of HDPE, EVA, rubber, and EPDM to preclude and buffer impact, increase friction and reduce vibration. We produce the rail pad for E type rail fastening system and SKL type rail fastening system. Following are the properties of the HDPE/EVA/Rubber.